K'NEX Brands, L.P. is a privately held company, with the headquarters and manufacturing facility located in Hatfield, Pennsylvania. Today, K'NEX is the most innovative and fastest growing construction toy company. Internationally, K'NEX products are distributed in over 30 countries. K'NEX Brands is also proud to distribute BRIO trains and toys, as well as Lincoln Logs in the North America. I received the K'NEX "Fort Lincoln" Lincoln Logs Building Set for review. Cooper absolutely loves to build, so needless to say, he was thrilled when we received this product. He immediately started building when we opened the package. He and I spread out all of the pieces and built Fort Lincoln, which I must say, is very cool! Build a frontier fort with the classic, all-wood Lincoln Logs® that you remember! Fort Lincoln contains 170 all-wood pieces, richly stained to match the colors of the timeless wood logs you remember building with as a child. 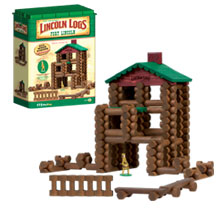 As an added bonus, the set comes with a traditional die-cast figure - just like in the original Lincoln Logs® sets. The set includes step-by-step instructions and the handy storage container stores the parts when playtime is over. 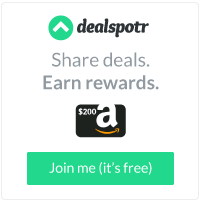 I would highly recommend this product to any family. My family had a blast building Fort Lincoln the first time, and every other time that we have built it since then. I also love the fact that Lincoln Logs come packaged in a sturdy container for storage. You can't beat that! Be sure to check out the K'NEX Fort Lincoln Building Set today!